Sharon Licata Presents Sculpture in Bloom, an unusual collaborative exhibition combining the sculpture of Sharon Collings Licata and the floral artistry of arrangers from Dimension in Art, a Judges Study Group of the SC Garden Clubs, Inc. is scheduled for September 6-11, 2012. The show will be at Gallery 80808 of Vista Studios, 808 Lady Street in Columbia, SC, with an opening reception on the 6th from 4-8 pm. Gallery hours will be 11am-5pm daily. 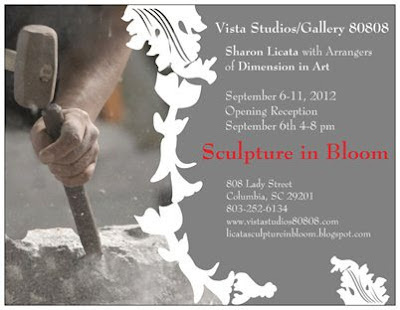 The sculptor, Sharon Collings Licata of Vista Studios (www.vistastudios80808.com) has invited the talented floral designers of Dimension in Art to each create an artistic arrangement as their response to one of her sculptures. Dimension in Art is a group of 25 Nationally Accredited Flower Show Judges (National Garden Club, Inc.) with members from Cayce, Chapin, Chester, Columbia, Greenwood, Florence, Hopkins, Johnston, Kershaw, Lexington, Santee and Sumter. 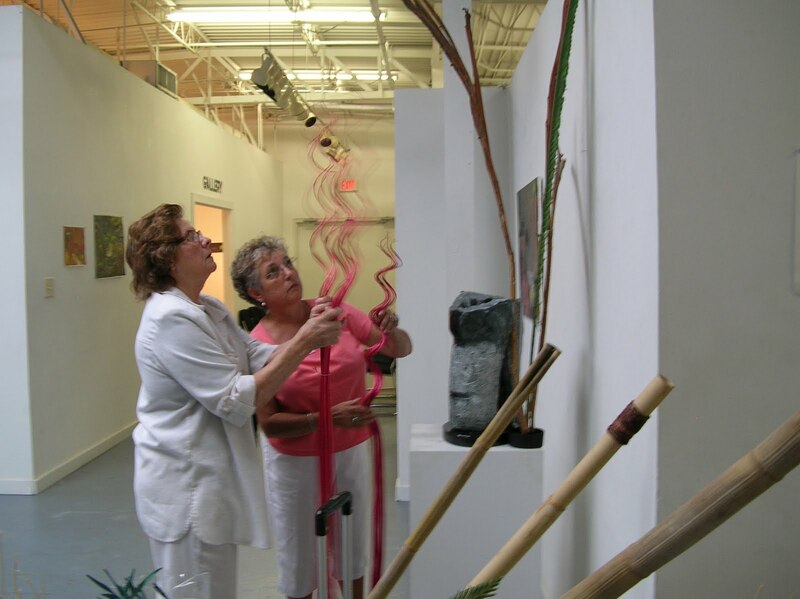 They meet monthly in Columbia to promote advanced creative expression through the study of experimentation in horticulture, floral design and allied arts. Artistic designs of the floral arrangement type are purposely a temporary creative expression. As such, this work can be considered in the same artistic vein as more the recognized installation or performance art. However, this has not usually been the case. This exhibition will give visitors a chance to enjoy an art form that is rarely seen in a gallery setting. It is especially fascinating given the juxtaposition of responding to stone sculpture which has a classical history. The designers are taking two different approaches to the sculptures. 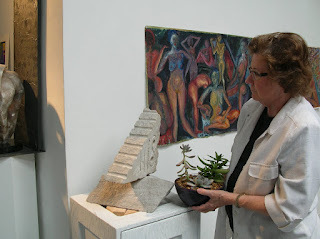 A number are doing an arrangement which incorporates the sculpture while others are creating a stand-alone design inspired by the stone work. Pat Abercrombie’s red and black interaction with a large unfinished limestone sculpture will be the first to come into view as people approach Gallery 80808. Ruth Bowers will be combining a floral sea scape with the bronze sharks “Into the Deep” as Donna Donnelly works with the twists and turns of “Intertwined”. Janice Hull takes on “Whirling Dervish” and all that it inspires. Helen Samantha Martin will have lots of Lighting flying around the alabaster piece “Thunder”, while Marcia Montgomery will also be up in the air responding to “Blue Clouds Sailing”. Joy Salter will be taking a look inside with “Inner Shelter” as Betty Smith works her way around “Twisted Lady”. Pat Setzer will be dropping in on the southern hemisphere with her Aztec Artifact including the limestone sculpture “Ancient Eight”. Standing Tall by Ann Yonce influenced by “Epiphany” will provide yet another way to look at sculpture. A web site http://licatasculptureinbloom.blogspot.com/ has been created that the arrangers visited to choose the sculpture that most inspired them. Once they committed to a sculpture, the designer’s name was posted by that image with a notation that it is “taken”. As of this date, Pat Abercrombie, Ruth Bowers, Donna Donnelly, Janice Hull, Sammy Martin, Marcia Montgomery, Joy Salter, Pat Setzer, Betty Smith, and Ann Yonce have made their selection. We are excited to be offering an exhibition at Gallery 80808 that combines two different art forms to help “kick off’ Columbia’s Fall gallery season. Please note that we are also collaborating with First Thursday on Main St. (also on September 6th) to create a major Art evening for the metro area. Come see us early, (4-8 PM) then head up to Main St. (6-9 PM). Plus a Cruise In with “Art in Motion” and much more.